Follow iconic Magnum photographer Martin Parr across Georgia as he creates his first commission for a major US art museum. Click Here To Follow The Film On Facebook! 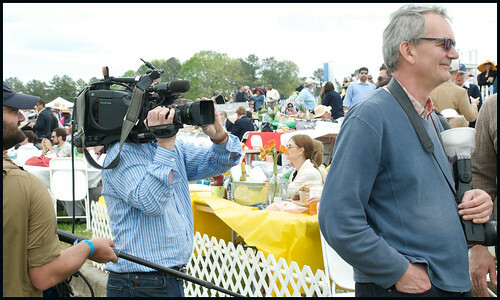 My 30 minute documentary short, Hot Spots: Martin Parr in the American South, will provide a fun, entertaining and unique perspective on the career and creative process that drives the controversial Magnum photographer. The humor, the irony and the biting social commentary that make a Martin Parr photograph a Martin Parr photograph are all on display as we watch him take the shots for this rare American museum commission. The characters he meets along the way add to the roller coaster ride and road trip attitude and the perspective offered by an insightful group of photographers and curators adds to the fun. A corn dog will never look the same again. 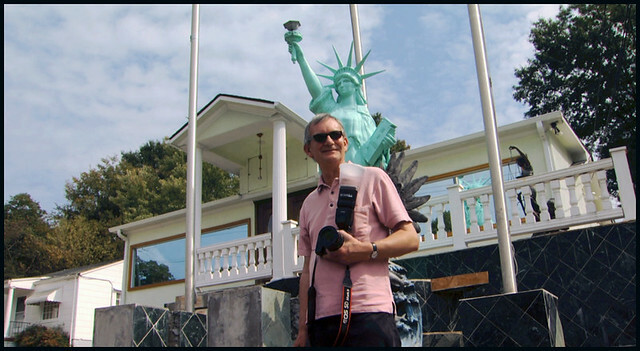 Martin Parr has, to say the least, a loyal following around the world. Whether it is in Europe, Asia, Australia or Africa, Parr is revered for the irony, social commentary and humor embedded in his photography. This past summer in Paris people stood in line for hours to have him take their photo and sign a book. There is even a song about him by a French folk singer. His work is seen in galleries and museums around the world and is held in many of the important photography collections. This commission is a first for Parr...his first by a leading art museum in the United States, the High Museum of Art in Atlanta, Georgia. Parr visited Atlanta twice, once in October, 2010 and again in April, 2011. I was there filming every step of the way. Parr brought his iconic style to everything from the Silver Skillet diner to CNN Center. The film looks at Parr’s creative process, his style, career and his impact on modern photography. During the sumer of 2011 I filmed a series of interviews with a select group of people, each in a unique positions to discuss Martin Parr's photography. Magnum photographer Susan Meiselas, photographer John Gossage, Chief Curator at the deYoung Museum of Fine Arts in San Francisco Julian Cox, former front New York Times photo editor and critic Philip Gefter and High Museum of Art Curator of Photography Brett Abbott all sat down to be filmed for this documentary. And, of course, we interviewed Martin to add to the material we gathered in the field. Full of humor, insight and amazing photography, Hot Spots: Martin Parr in the American South, with your gracious help, will open a window onto the world of this quirky and fascinating artist. Martin has a great Web site where you can learn more about him. Here is the link, www.martinparr.com. The Magnum Web site is home to Martin's images, click here to see them. Pledge $10 or more and receive a digital download of one of the DVD bonus features, email alerts on the project and notification about when and where the film can be viewed. Your name will also be listed on the Hot Spots Web site. Pledge $30 or more and receive a digital download of the DVD main feature, a digital download of one of the bonus elements and your name will be listed on the Hot Spots Web site, www.martinparrfilm.com. 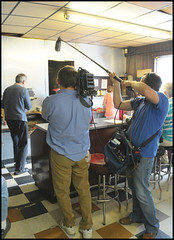 Pledge $45 or more and receive the DVD, Hot Spots: Martin Parr in the American South. The disc will include the 30 minute documentary and an additional 30 minutes of bonus material including a slide show of images not included in the book or film. Your name will be listed on the Hot Spots Web site. Please add $10 for delivery outside the United States. Pledge $75 or more and receive a postcard signed by Martin Parr, the DVD and your name will be listed on the Hot Spots Web site. Please add $10 for delivery outside the United States. Pledge $100 or more and receive a Hot Spots movie poster that is made from an image from the Atlanta series, the card signed by Martin Parr and the DVD. Your name will also be listed on the Hot Spots Web site. Please add $20 for delivery outside the United States. Pledge $160 or more and receive a copy of Martin Parr’s 2007 book, TuttaRoma, a signed card, a poster and the DVD. Your name will also be listed on the Hot Spots Web site. TuttaRoma is limited to this pledge level only. This is also the final level for signed cards. Please add $20 for delivery outside the United States. Pledge $200 or more and receive a copy of Martin Parr’s upcoming book Up and Down Peachtree: Photos of Atlanta by Martin Parr, a poster and the DVD. Your name will also be listed on the Hot Spots Web site. Please add $20 for delivery outside the United States. Pledge $250 or more and receive a signed copy of Up and Down Peachtree: Photos of Atlanta by Martin Parr, a signed DVD and a signed poster. Your name will also be listed on the Hot Spots Web site. Please add $20 for delivery outside the United States. Pledge $400 or more and receive a signed copy of Up and Down Peachtree: Photos of Atlanta by Martin Parr, a signed DVD a signed poster and credit in the film as a Kickstarter Producer. Your name will also be listed on the Hot Spots Web site. Please add $20 for delivery outside the United States. For 5 groups of 2 people only (5 spots available total)! Martin Parr will give a guided tour through his photos in the High Museum. This 30 minute tour, followed by a glass of wine at Table 1280 across the piazza from the museum will take place on Thursday, June 14, the same day as the screening of the film in the Hill Auditorium on the museum campus. At the event the lucky group will also receive a signed copy of Up and Down Peachtree, a signed DVD and a signed poster and all the names will be listed on the Hot Spots Web site. Please note this happens in Atlanta on June 14 at 4 p.m.
For two people only! Pledge $6,000 or more and you will receive a 20” x 30” print of your choice from the Atlanta series. The print, shipped directly from Martin's London studio (unframed), will be signed by Martin Parr (#1 edition of 10). This level also Includes a signed copy of the Peachtree Book, a signed DVD and a signed poster. Additionally, your name will appear in the credits as a Senior Kickstarter Producer and your name will be on the Hot Spots Web site. Shipping will be billed separately. These prints are valued at $7,000.